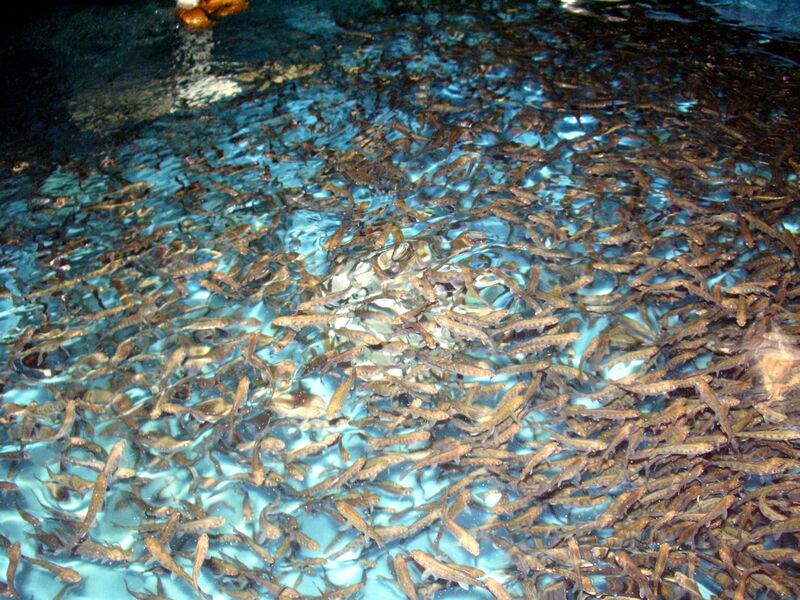 We offer a large range of stocking fish for your pond. Our staff can help you make a decision on the types of fish you want to stock and help determine the rate densities that will best suit your needs. Click on the Stocking Fish Price List below to view our selection. Some fish are seasonal. We do not have all sizes available year round. Call for availability. Stocking fish are customer pick-up only. (Orders large enough to require a box truck will be considered for delivery.) We do not take orders ahead of time as we do not have the capacity to hold orders. Please call us before you come to see what we have in stock. When you arrive, stop at the retail store to place your order. 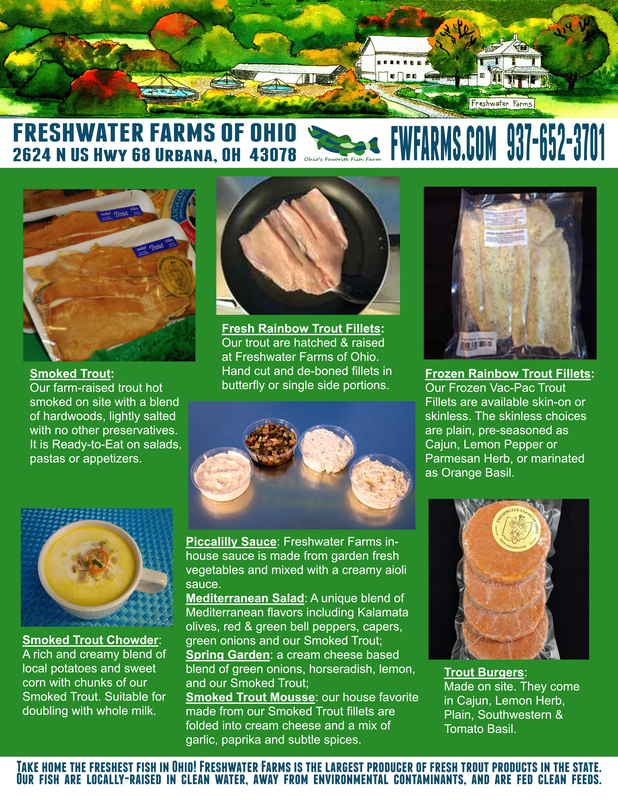 We will give you a receipt to take down to the fish barn where your order will be prepared. We package our fish in 14″ x 14″ x 14″ boxes that weigh approximately 20 pounds when full. Boxes are $2 each and include the bag, oxygen and water needed to transport the fish. When you come back for your next purchase, bring your box back and we’ll be happy to reuse it. Even if boxes have been stored flat, we can retape them if they’re in good condition. The packaging rates below are figured for a drive time of up to 3 or 4 hours. If more drive time is required, the amount of fish per box will need to be reduced. If you have any questions do not hestitate to contact us. 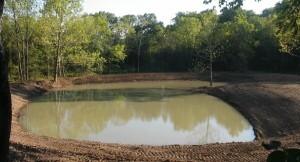 We look forward to assisting you with your pond & lake management needs. If you have a brand new pond, the decision of which fish to stock in your pond and when to add them can be a little overwhelming. Get started with minnows. Give them a month or so to get established. If you don’t, it’s very likely that other fish will eat them before they’ve had a chance to grow and reproduce. It is a good idea to create a habitat for them in a shallow end of you pond with sunken trees, pallets, etc., so they have somewhere to spawn and hide from predators. After one month, begin introducing other species into your pond. Red ear sunfish and perch are great in swimming ponds b/c they are on the shy side and tend to stay away from people. Stocking Largemouth Bass: You should stock smaller sizes if you put them in at the same time as other species of fish to ensure that they won’t be large enough to eat the other fish. Or, wait to put larger bass in after the existing fish have had a chance to grow. Adult largemouth bass will benefit from stocking golden shiners which grow to a larger size than fathead minnows. The difference between hybrid bluegill and standard bluegill is that hybrid are 90% male. Therefore, hybrids tend to grow larger and do not reproduce as much as Standard Bluegill. Bluegill are ok for a swimming pond but the males will occasionally nip at swimmers. Standard bluegill are recommended over hybrid bluegill. Rainbow Trout are cold water fish. 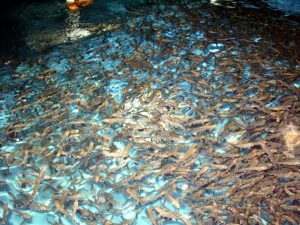 They need water temperatures that stay below 70 degrees year round and oxygen levels twice that of other fish. Therefore, the cold water at the bottom of most ponds is usually not suitable because of the low oxygen. White Amur feed on algae and are great natural solution for keeping algae under control in your pond as long as you stock the right amount for the size of your pond. You can stock white amur any time of the year. While the reduction of vegetation helps benefit swimming and fishing activities, we recommend the construction of a nursery and spawning habitat using sunken evergreen trees and structures.